This is an incredible home cinema projector. It delivers the most incredible contrast ratio. With this projector it is 2,000,000:1. And that added to the lumens of 3,000 gives you the most perfect picture that I personally have seen on any projector that I have ever tested. Overall you are seeing what is an incredible picture. The image that it produces is just the very very best we have ever seen on any projector – and something you have to see in person to appreciate. This has to be one of the best projectors that is available currently. When it comes to projectors, you need to go laser if you want the best picture possible. But buying this kind of cinema-quality tech has always been the reserve of the really rich … until the UHZ65 arrived. This projector blows the mind with its HDR pictures, the laser system creating deep blacks and vibrant colours. The 4K image is also packed with detail. It’s not too large either, so you won’t need to create a whole cinema space just to accommodate it. 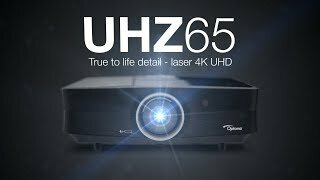 “The most successful feature of the UHZ65 is the color and contrast management, you get a nearly a perfect result with a few clicks, the price for the performance given is very good"
If we look at the Optoma against the existing 4K DLP projectors on the market then it is clearly the best we have seen to date, given the improved black levels and colour gamut. The other strength of DLP is brightness and the UHZ65 is an excellent choice for a normal living room environment with light coloured surfaces and some ambient light spill (just not directly on screen). Used on an 80-inch screen, the UHZ65 produced a sparkling array of tone and textures and an all-round radiant look. Those red, blue and green lasers also combine to create more subtle effects, with complexions remaining realistic and never over-cooked. For anyone who thinks HDR is impressive, but just too darned bright on an expensive TV, the UHZ65's more cinematic treatment will impress. Its laser light source works to produce big screen images with bags of 4K detail, decent colour and excellent upscaling. The performance remains high when fed Full HD material. The UHZ65 is particularly quiet, it can display 24p without any jolt. It has a good way of dealing with colors, with nice liveliness, without it being too much. The projector displays great quality (in DLP) : real blacks and a great contrast.